A lack of awareness about women’s heart disease led Dr. Salpy Pamboukian to establish the UAB Women’s Heart Health Clinic in 2016. Photo courtesy UAB Medicine. According to the Centers for Disease Control and Prevention, heart disease is responsible for one in four deaths among both men and women. And the highest concentration of heart disease deaths for women is in the South – especially in Alabama, Mississippi and Louisiana. This lack of awareness about women’s heart disease led Dr. Salpy Pamboukian to establish the UAB Women’s Heart Health Clinic in 2016. While the classic signs of heart attack in men – chest pain radiating into the jaw and arm – are well known, a woman’s symptoms may differ dramatically. She notes that pain might not flare up with exertion, as is often the case with men. In fact, sometimes there’s no pain at all. “The symptoms can be shortness of breath, nausea or vomiting, tiredness or fatigue, or abdominal discomfort,” she said. Ignorance about the prevalence and symptoms of women’s heart disease can, unfortunately, extend to the medical community. As a result, there can be a significant lag between the time a woman begins experiencing symptoms of heart disease and the time she receives a diagnosis and treatment. Witnessing those delays prompted Pamboukian to create the UAB Women’s Heart Health Clinic. Today, women travel a variety of paths to the UAB Women’s Heart Health Clinic. Some have ongoing symptoms that eventually lead a physician to order an electrocardiogram (EKG) or chest X-ray, resulting in a diagnosis of heart disease and a referral to the clinic. In other cases, women arrive at the doctor’s office or emergency department with heart disease symptoms, are diagnosed quickly and are sent on to the clinic. Joy O’Neal, 50, eventually found the Women’s Heart Health Clinic, but only after being told by doctors that her weight gain, fatigue and difficulty breathing were due to menopause, stress and allergies. In fact, she had congestive heart failure. “Even though I presented every symptom of heart disease, they never, ever ever offered me an EKG,” said O’Neal, the founder and executive director of The Red Barn, a therapeutic equine center in Leeds. Once a woman’s heart disease has been identified, the next step depends upon her diagnosis. In between are those who require arteriograms, stents, valve replacements or bypasses. Pamboukian’s goal is to provide a central place for women to be seen and then refer them to appropriate specialists. “For example, we have a renowned hypertension specialist and a clinic for people who have difficult-to-manage high blood pressure,” she said. Although Sherron Simmons’ story has a happy ending, her journey through heart disease was a rollercoaster. Following two heart attacks and bypass surgery, Simmons, now 62, was diagnosed with heart failure and then referred to UAB’s transplant team. Simmons received her heart transplant in 2011 and said she is feeling great today. “I’m staying in compliance with everything that Dr. Pamboukian and my wonderful transplant nurse tell me to do, and I haven’t had any rejection episodes with my transplant,” Simmons said. Pamboukian notes that Simmons’ and O’Neal’s health care hurdles are the norm and that one of the best ways to promote healing is education. 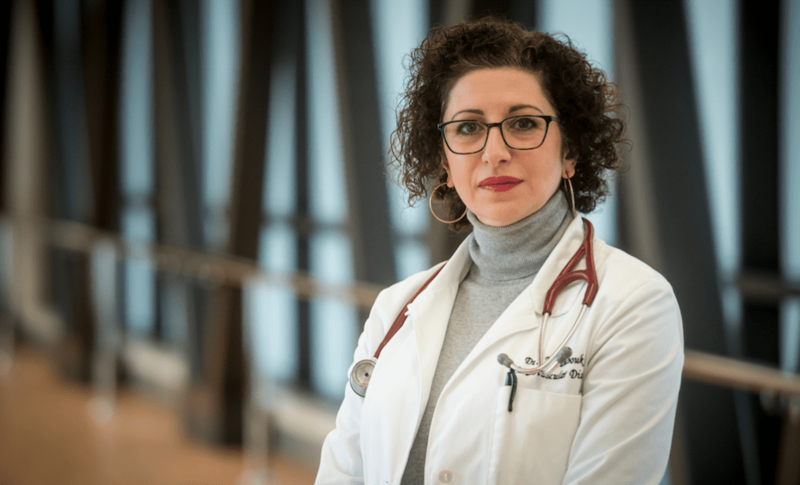 Pamboukian’s commitment to empowering female patients led UAB Medicine to partner with WomenHeart: The National Coalition for Women with Heart Disease, an organization dedicated to heart disease education and patient support. She nominated Simmons and O’Neal to become UAB WomenHeart Champions and secured coalition funding to send the two women to the Mayo Clinic to receive training in heart health advocacy. Nearly 50 women ages 26 to 74 and from 18 states participated. The attendees, all of whom had heart disease, learned about a variety of topics that ranged from heart disease risk factors and healthy lifestyle choices to mental health and stress reduction. O’Neal echoes Simmons’ sentiments, adding that the information she gathered was eye-opening. As UAB WomenHeart Champions, Simmons and O’Neal are helping educate women in the Birmingham area about heart health. Pamboukian believes the two volunteers are uniquely qualified to spread the word. “Women can connect with Sherron and Joy on a personal level and understand that the same thing could happen to them, rather than learning information from health care providers who haven’t lived through the experience of heart disease,” she said. Pamboukian has high expectations for UAB’s WomenHeart program. Armed with WomenHeart PowerPoint presentations, lectures and handouts, Simmons and O’Neal plan to launch UAB’s heart health initiative this month. Simmons is excited about the prospect of helping women with heart disease find one another. She plans to rely on the UAB community to speak at monthly meetings. Simmons said the opportunity to help other women through sharing her story is something she’d prayed about. O’Neal has doubled down on educating women about heart disease, in part because, even after her diagnosis, she still fights ignorance within the medical community. A dermatologist told her she was too young to have heart disease and questioned whether she’d in fact had a heart attack. Before her diagnosis, every time O’Neal saw her primary care physician, he asked whether she’d had a mammogram. Both O’Neal and Simmons say they are grateful for the UAB Women’s Heart Health Clinic.